This year Social Business Network and the Juan Francisco Paz Silva Coop are excited to announce two scholarships for high school graduates from Achuapa, Nicaragua to attend the National Institute for Higher Learning in Oriental Medicine (IESMO). The Japanese-funded University offers an accredited five-year program in acupuncture and shiatsu massage. For decades the farmers Cooperative has supported a small acupuncture clinic to provide alternative healthcare options to residents, and seven years ago offered the first scholarships to two young women from rural communities to study in the capital. One of them has returned to Achuapa as a licensed Doctor of Oriental Medicine, where she has worked with the cooperative to expand the clinic and stock an herbal pharmacy. This year she also taught an introductory course in herbal medicine to a group of women in the Recognition of the Unpaid Work of Women Initiative. Along with the expansion of the clinic in Achuapa and the decision to offer another round of scholarships, awareness of holistic alternatives to mainstream medicine is gathering support in Nicaragua. As private reiki, massage, and acupuncture clinics spring up in every major city, the Ministry of Health trialled the inclusion of one natural medicine practitioner at public clinics in Managua. The new program has received strong positive feedback, with many residents choosing to use massage or acupuncture as a treatment on the public health system. The Ministry of Health recently announced a plan to open a position for a natural medicine practitioner at clinics in four other cities in Nicaragua, creating even more job opportunities for graduates of IESMO. The farmers coop in Achuapa realizes that this growing demand for alternative health care doesn’t only provide the opportunity for them to support young people on a career path in natural medicine, but also opens up a new local market for farmers to grow and process herbs for natural remedies. 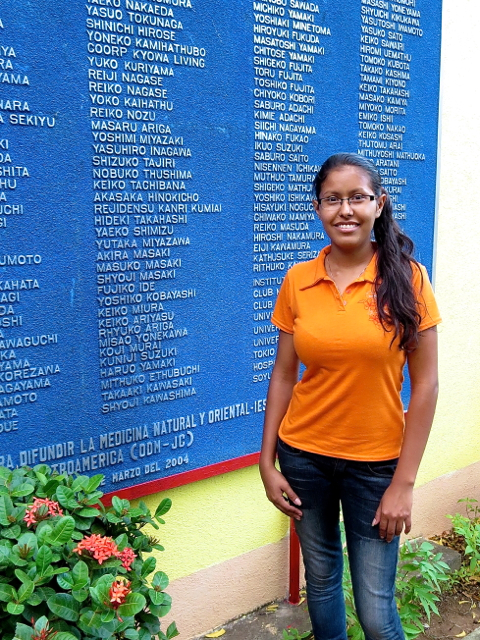 Diosmara Rayos, first year student in front of a plaque of Japanese partners at the Institute for Higher Learning in Oriental Medicine, Managua, Nicaragua. The first recipient of this scholarship is Diosmara Rayos, 19. Diosmara is a bright young woman who has shown her dedication to studies for many years: without an available high-school near her rural community, she left home at 14 to attend the high-school in Achuapa, where she graduated at the top of her class and then studied English for two years at a community college in Esteli before hearing about the scholarship for Oriental Medicine. She comes from the small community of La Arinconada in Achuapa, a land cooperative formed during the Agricultural Reformation in the 1980’s. She became familiar with oriental medicine when her mother began treatment for a life-threatening illness at IESMO, where she was treated by Japanese doctors for over nine years. Diosmara says she was inspired by her mother’s experience to study acupuncture and massage. We are very proud of her decision and thrilled that at the end of her first semester she is among the top students in her class! This entry was posted in Better Supply Chains, Cooperatives, Recognition of the Unpaid Work of Women, Social Business Network and tagged Achuapa, Acupuncture in Nicaragua, Juan Francisco Paz Silva Coop, Oriental Medicine, Recognition of the Unpaid Work of Women, Women's Empowerment on 09/06/2014 by rwlindsay.